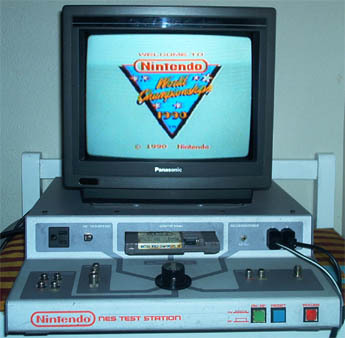 This system is used to test Nintendo game paks and systems along with AC adaptors, RF switches and A/V cables. The green button has "AV/RF" written above it. The blue button has "RESET" written above it. The red button has "POWER" written above it. The knob in the middle is used to switch between the various test modes. The center position is to test a game pak. 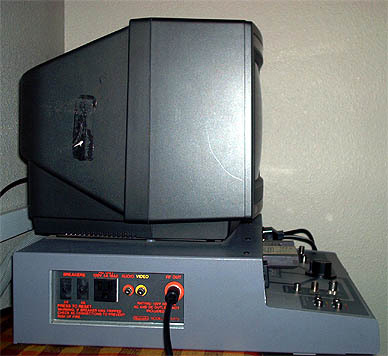 In this mode you can play games on this system. Moving in a counterclockwise direction the switch positions are for "AC ADAPTOR", "RF SWITCH", "AUDIO/VIDEO CABLE", "CONTROL DECK" and finally "ACCESORIES".